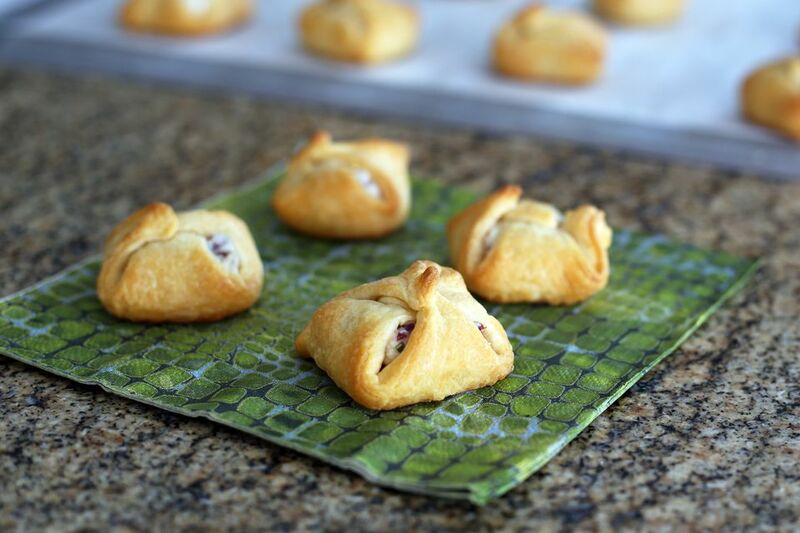 These party-ready cream cheese and cranberry crescent roll bundles are an excellent way to celebrate any occasion. Unlike fresh cranberries, dried cranberries are available year-round, which means these little appetizers can be made and enjoyed any time of the year! The walnuts go particularly well with the cranberries, but feel free to use chopped pecans in the filling. For sweeter bites, omit the chives and replace them with a few teaspoons of finely grated orange zest. While ungreased baking sheets are okay, parchment paper makes an excellent lining for the pans. The paper helps keep the bottoms from over-browning, and it makes cleanup a breeze. Feel free to use silicone baking sheets instead of parchment paper, as they provide similar results. In a mixing bowl with an electric mixer, beat the cream cheese with the dash of cayenne pepper until creamy. Add the chopped cranberries, the finely chopped walnuts, and the chives. Mix well with a fork until thoroughly blended. If baking right away, heat the oven to 375 F.
Remove one roll of crescent rolls from the can. Spread the roll out on a lightly floured surface. Pinch and seal the perforations. The sheet will measure about 12" x 8". With a pizza cutter or knife, slice the dough into 24 (2-inch) squares. Use a ruler to get even squares. With a measuring teaspoon, scoop up a scant teaspoon of the cream cheese mixture. Drop the cream cheese mixture onto the center of a 2-inch square of crescent roll dough. Bring opposite corners together over the filling; twist the top corners slightly and pinch to seal. Repeat with the remaining squares and cream cheese filling. Open the second can of crescent roll dough and repeat steps 4 and 5. At this point, you can choose to refrigerate the bundles for up to 3 hours; bake them just before serving time. Bake the bundles in the preheated 375 F oven for about 10 to 12 minutes, or until golden brown. Use a large, sharp knife to chop the walnuts. You want to have finely chopped nuts, and if you use a food processor or grinder, you could end up with nut butter. To eliminate the walnut "dust" you'll have on the cutting board after you chop the nuts, put them in a colander or sieve and shake until the fine particles are gone. To prepare the chives, tie a small bunch together with a rubber band. Using a knife or scissors, chop or snip the stem ends; move the rubber band up as you get close to it. The rubber band holds the chives together, making it easier to prep several stems at once.